Pete Townshend’s lyrics, “Won’t Get Fooled Again”, play in my head as I write. Will our new “boss” be any better than our old “boss”? NO! Out of the candidates running for the GOP nomination, this statement applies to all but Ron Paul. Get your head out of the cloud of punditry. Look at measurable data and voting records. I digress. Or, maybe not. 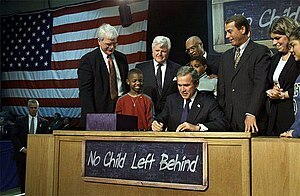 The architect of No Child Left Behind (NCLB), President Bush’s first senior education advisor, Sandy Kress, has turned the program, which has consistently proven disastrous in the realm of education, into a huge success in the realm of corporate profiteering. After ushering NCLB through the US House of Representatives in 2001 with no public hearings, Kress went from lawmaker—turning on spigots of federal funds—to lobbyist, tapping into those billions of dollars in federal funds for private investors well-connected to the Bush administration. High stakes testing (standardized testing) is a billion dollar industry funded on the overloaded backs of producers. Only the insiders benefit from the billion dollar scheme. No child or teacher benefits from these stupid tests. Parents need to place a strangle hold on the pocket books of Government School profiteers like Sandy Kress, Harold McGraw III, the Big Three—McGraw-Hill, Houghton-Mifflin, and Harcourt General, Bill Bennett, and Neil Bush. Practice civil disobedience – refuse to allow your child to be tortured by the Procrustean system. Check out The Bartleby Project and opt out. Teachers are shackled by invisible chains. This revolt must be student and parent driven. Organizations formed to “help” the cause will only corrupt the resistance. It must be a grassroots movement. Students, parents, teachers, and administrators will follow. The scheme of Government schooling fools only those who want to be fooled. With this much confiscated money at stake, the fooling comes by force. Failure is built-in the system to keep the elite’s ship floating on fiat dollars. The “gang of robbers and murderers” responsible knew what they were doing by creating NCLB and “Race To The Top”, Obama’s 2.0 savior of “education”. By the way, states opting out of NCLB are the guinea pigs for a national curriculum. Never trust the government elites. Look up their sleeves. Under NCLB, as school districts receive federal funding they are required by law to hold 20 percent of those funds aside, anticipating that its schools will fail to meet its Annual Yearly Progress formula. When that “failure” is certified by test scores, the district is required to use those set-aside federal funds to pay supplemental education service (SES) providers. Ignite! has placed products in forty US school districts, and K12 offers a menu of services “as an option to traditional brick-and-mortar schools,” including computer-based “virtual academies,” that have qualified for over $4 million in federal grants. Under NCLB, supplemental educational services, whose results are being increasingly challenged, reap $2 billion annually. Remember the Atlanta cheating scandal? Why would anyone appear shocked that system-wide cheating took place? 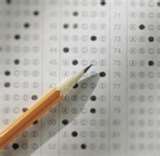 In my school, we’re expected to have a 100% passing rate on the high stakes testing by 2014. How our local educrats are able to pass this information on to us with a straight face is beyond my capabilities of understanding. Some form of hypnosis has to be used. When we fail, and we will fail to reach this mythical goal, reform will be necessary: Translation – bend over and open your wallet for more government spending solutions. It’s worked so well in education thus far. Equality in education for all in our fantasy Utopia can be achieved – cheating required! Gangsta Government “Education” manages ignorance for profit. Power is so addictive. Sadly, most are addicted to this Collective induced hallucination.